NuBryte Touchpoint brings smart home features like automated lighting, subscription free home security, home intercom, remote lighting control and more, together in one simple-to-use, streamlined touchscreen console. NuBryte Touchpoint can replace one or more of your home’s light switches and are compatible with dimmable LED, CFL, and incandescent light bulbs. Free secure cloud storage included. Power source: In-wall AC 120v/60Hz. Neutral wire required. The NuBryte Touchpoint is for use with permanently installed lighting fixtures and is not compatible with ceiling fans or multi-way switches. Coming Soon: The NuBryte Flex and NuBryte Touchpoint+Fan will bring you ceiling fan control; 3, 4 & 5 switch control and multi-way switch control. Our new products will be fully compatible with the NuBryte Touchpoint and other NuBryte devices. Android is a trademark of Google, Inc.
ALL-IN-ONE HOME AUTOMATION by simply replacing your Dual Switch (double gang) light switch with NuBryte Touchpoint. Make your house a smart home in minutes, and control it all from any console, or remotely via free Nubryte App. See Single Switch size product for single switch locations. SMART LIGHTING: 5 easy-to-use advanced lighting modes for whole-home lighting control and digital dimming. 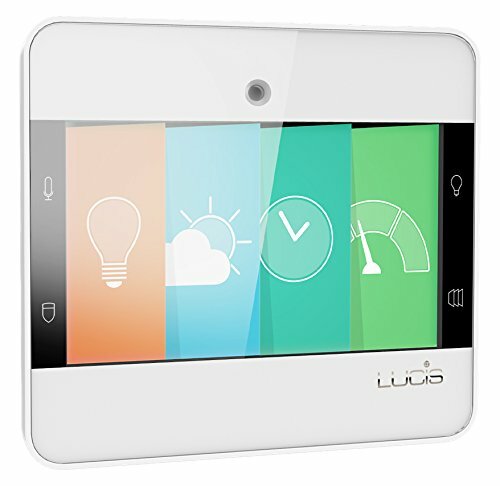 Motion-based on/off, Morning Wake Up, Bedtime dimmer, Night light and Vacation lights. Works with standard dimmable bulbs. HOME SECURITY: Built-in wide angle camera and advanced motion detection up to 35′. Receive instant video alerts on your iOS or AndroidTM when alarm is triggered, alerting you to the disturbance. Detract intruders with a 2-stage alarm with both sound and flashing overhead lights. No Contracts/Monthly Fees Required. WIRELESS INTERCOM: Combine 2 or more Touchpoint consoles for an instant home intercom system. Wi-fi based. FAMILY FEATURES: Weather updates and forecasts, family hub, calendar and organizer, notifications and event alerts, energy monitoring, and more! Lights On and Off by Home Automation Inc.